Late in the day, Dan and I headed to Old Lyme, Connecticut and the banks of the Connecticut River. The light was very interesting on this particular day, and of course, Dan wanted to take advantage of this sky and atmosphere. On the way, we stopped at a horse farm so that he could photograph. As usual, he was armed with his camera, sketch pad, and colored pencils–prepared for everything. He will be doing a large painting of this farm-the light was spectacular, casting shadows and reflections in a pond-it was a surreal scene. The farm is also located in Old Lyme. Years ago, and still now, artists gravitated to Old Lyme because of the light and the paintings that could be created. Maine has also become an artist’s destination because of the atmospheric lighting that can be captured on canvas. As we headed to the river, Dan was anxious because the clouds were rolling in, and he was concerned that he would not have good lighting. He didn’t have to be concerned, because you can see the result of that trip. What was interesting about the beach and sky was the color of the sky-if you turned your head to the right, it was one color and to the left another. You almost felt that you were on the beach on two different days, and having different energy on each day. 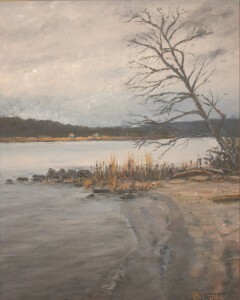 “Leaning Tree” was going to be his subject and inspiration because of the unusual angle of the tree reaching to the Connecticut River, and the light hitting the beach. Across the Connecticut River, the grasses were also being touched by the sunlight, and setting up a compelling composition. The flow of the water is bringing the viewer into the painting, around the bend, and across the river to the sunlight. In this piece, the chroma is cool in the background of the hills, and turning slightly warmer in the nearest hill. Even thought the sky appears to be cloudy, there actually was some blue sky (not visible in the painting), and this created the beach to be sunlit. Dan is working on a composition that is showing this interesting sky-it is of the old boathouse right on the banks of the river. The workings of this painting will be displayed in the next few days on the blog. His technique was done exclusively with a brush, and again with heavy application of paint. The color palette was of greys and blues with a touch of warmth with a medium yellow earth tone. Because it is such a neutral palette, this piece of art will go with any decor, and it will bring a sense of peace and serenity to an office or home. The limited use of color creates a cohesiveness. “Leaning Tree” is framed in a traditional gold leaf frame, and this work becomes a very typical New England style painting, but will fit in with any decor. The energy of this composition is one of serenity, peace and calmness. It is on display and for sale at Artisans Harbor in Old Saybrook, Connecticut, and listed on our Art Gallery on our website www.danielsdahlstromartist.com. You can also access Artisans Harbor from our “Links” page on our website. The store is amazing, with beautiful work by local artisans. Please stop by and say hello to Cheryl the owner.